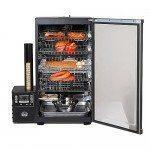 The Bradley Electric Smoker model BTDS76P is a reliable, easy to use smoker full of rich features. The temperature, time, and smoke are now completely controllable so you can decide how much smoke you want, how long your food is going to be smoked for, and at what temperature. 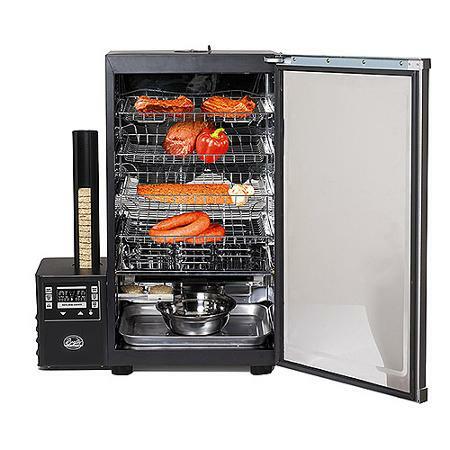 With temperature adjustments up to 320 degrees and four meat racks this electric smoker can produce great smoked chicken, beef, fish and more with ease. 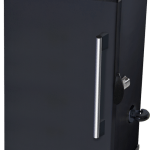 The Bradley Electric Smoker model BTDS76P is a reliable, easy to use smoker full of rich features. The temperature, time, and smoke are now completely controllable so you can decide how much smoke you want, how long your food is going to be smoked for, and at what temperature. The Bradley BTDS76P has a simple to use push button digital readout control panel that has settings for both smoke levels and temperature settings. A timer control can set the time limits for both smoking levels and cooking times making this a true set it and forget it smoker. One downside is there is not an internal meat probe so we suggest buying a wireless digital meat probe to keep an eye on the internal temperature of meats being smoked in the unit. Once the “On/Off Smoker” button has been pressed to turn the smoke generator on, the “Smoker Timer” display will flash until the desired time has been set. The “Oven Temp” will start to read the internal temperature right away. Once the “On/ Off Oven” button has been pressed to turn the oven on, the “Oven Timer”display will flash until the desired cooking time has been set. The “Temp Setting” will also flash until the desired temperature has been set. Press the C/F Button to change the setting from Celsius to Fahrenheit. With four fully supported, removable racks you get better accessibility without tipping and can adjust the racks for cooking larger meats. 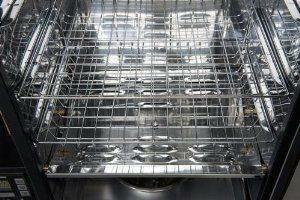 With 520 square inches of cooking space there is plenty of room for large cooks. 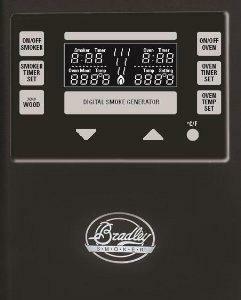 The Bradley 4-Rack Digital Smoker features separate burners for generating smoke, and for oven heat. This way you can have heat with smoke, heat without smoke, and smoke without heat for the perfect cook. 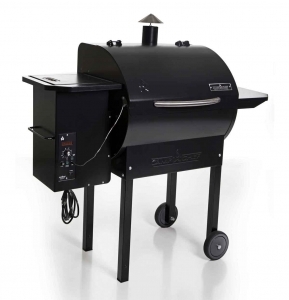 With a completely stainless steel interior, the smoker is more capable of heat retention and an easy clean-up. Plus it is fully insulated to keep a steady temperature even in cooler temperatures.